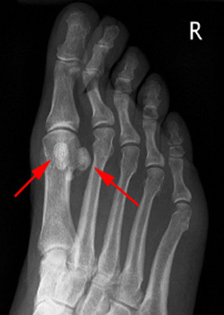 The sesamoids are a pair of small bones which are located within a major tendon underneath the big toe. The sesamoids help the tendon to glide as the big toe moves up and down. It actually mimics the much larger sesamoid in the body which we rely on every day - the knee cap or patella. There are a number of ways for these bones to develop and some patients have only one sesamoid, and sometimes the sesamoids are actually formed by 2 separate bones joined together by cartilage (bipartate sesamoid). Due to overuse or injury, the sesamoids can become painful. 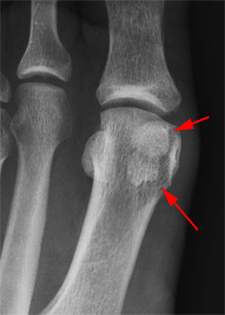 Occasionally the sesamoids can fracture due to a heavy blow (fall) or sudden unexpected movement of the big toe. Over time, the sesamoids and the nearby big toe join can become arthritc and painful. Treatment depends on the underlying problem with the sesamoids. Inflammation can be treated with special insoles which redistribute the pressure on the ball of the foot. Fractures can sometimes be repaired, however in severe pain or very fragmented fractures the affected sesamoid can be removed surgically.